Today was the only fully unscheduled day on my Milan itinerary. (Tomorrow being La Scala and Thursday being the Last Supper, and perhaps a day trip) After dropping my mercato purchases at the hotel, I set out to visit the top sights. And even the one it does have are kind of crap. First was Castello Sforzesco, a massive complex (well, it is a castle afterall) with a scattershot collection of museums. A few interesting items, but very poorly organized. The maps are impossible as well – there are at least three floors within the complex, but the maps don’t indicate which floor a given gallery is on, and staircases are few and far between. The small Egyptian collection was perhaps the highlight. When an Egyptian object says “provenance unknown,” we can pretty much assume “grave robber” right? From there, I took a look at Milan’s Duomo. An impressive structure, but again, didn’t really set me on fire. Was very disappointed that the archaeological exhibit under the nave was closed. 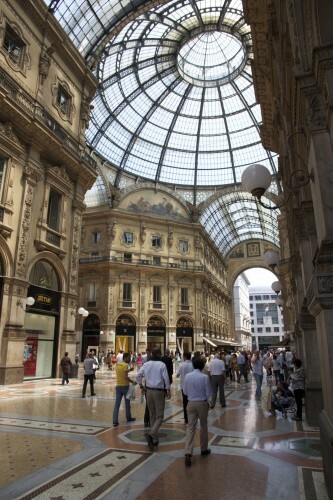 The church is adjacent to the rather amazing Galleria Vittorio Emanuele II, which perhaps more aptly reflects the soul of Milan. Perhaps the oddest thing is that, despite visiting what are ostensibly two of the hot spots for tourists, I have yet to run into any large tour groups. I’ve barely even heard any English spoken. I find this odd. I’m assuming it’ll change when I get to the Last Supper, but you’d think the groups would at least do drive-bys on some other sights.